3. Sukkot is the Jewish harvest festival, called the “Feast of Ingathering.” Hence, it can remind us that many more people can be sustained on vegetarian diets than on animal-centered diets that presently involve over 70 percent of the grain produced in the United States being fed to animals raised for slaughter, while about 800 million of the world’s people are chronically hungry and an estimated 20 million people die due to hunger and its effects annually. 6. On Shemini Atzeret, Jews pray for rain, and plead to God that it should be for a blessing, not a curse. This is a reminder of the preciousness of rainwater to nourish the crops so that there will be a successful harvest. Also, according to the Talmud (Rosh Hashanah 1.2), the world is judged on Sukkot with regard to how much rainfall it will receive. In the days when the Temple stood in Jerusalem, there was a joyous “Water Drawing Ceremony” (Simchat Bet Shueva), designed to remind God to pour forth water when it was needed. Modern intensive livestock agriculture requires huge amounts of water, much of it to irrigate feed crops. According to Newsweek magazine, the amount of water needed to raise one steer would float a Naval destroyer. A person on an animal-based diet requires up to 13 times as much water, most of which is used to irrigate feed crops, as a person on a vegan diet. 8. Moving out of comfortable homes to dwell in relatively frail sukkahs indicates that it is not our power and wealth that we should rely on, but rather that our fate is in God’s hands. And it is God Who originally ordained vegetarian diets for people, and created us with hands, teeth, and digestive systems most conducive to eating plant foods. 9. 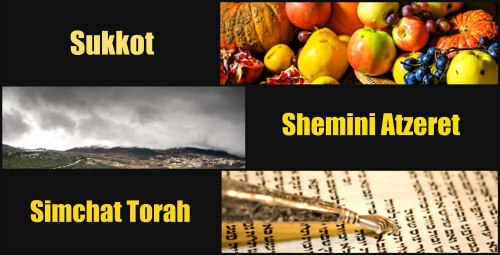 Sukkot’s prophetic readings point to the universal messianic transformation of the world. According to Rabbi Abraham Isaac Hakohen Kook, first Chief Rabbi of pre-state Israel, based on the prophecy of Isaiah (“the wolf will dwell with the lamb, . . . the lion will eat straw like the ox . . . and no one shall hurt nor destroy in all of God’s holy mountain,” (Isaiah 11: 6-9)), the messianic period will be vegetarian.